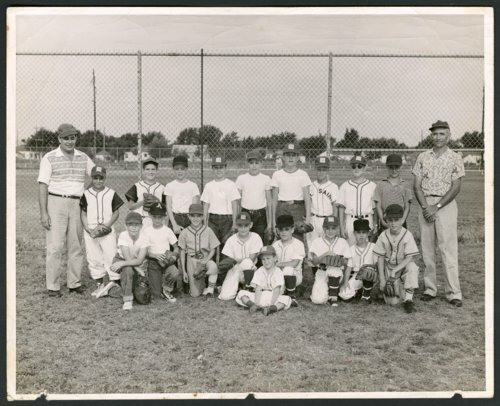 This photograph from the mid-1950s is of the Bartlett Hodags, a youth baseball team in Wichita sponsored by the Bartlett Potato Chip Company. Standing in the back row are (l to r): Martin Berndsen (manager); Scott Johnson; Joe Pat Cleaver; unknown; unknown; _____ Goertz; Harold Ketterer; Mike Slicker; unknown; unknown; and Henry Welicky (manager). Seated in front center is Mark Berndsen, the bat boy. Kneeling behind him are (l to r): Mike Hensley; unknown; Gary Randa; Reynold Welicky; Lynn Cocker; Steve Berndsen; unknown; and unknown.